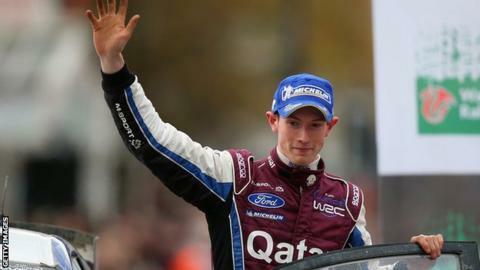 Welshman Elfyn Evans is to compete in next season's World Rally Championship. Evans, 24, will race for the M-Sport team in the 2014 FIA World Rally Championship. He and co-driver Daniel Barritt will drive for the Cumbrian firm's Ford Fiesta RS WRC for next season's championship. "It is an absolutely fantastic feeling to know that I will be driving a world rally car for a full season next year," said Evans. "Last year was a real development year for us, so it is great to be able to take the next step in my career and for myself and Dan to really progress within the team. "The great thing about this programme is that it gives us time. "The whole team is behind us and we have a long-term plan to get to where we all, ultimately, want to be." Evans is the son of former British Rally Championship winner Gwyndaf, and he becomes one of an elite band of Britons to have competed on a world stage, including Scotland's Colin McRae, who died in a helicopter crash in 2007, and Northern Ireland's Kris Meeke, who will compete for Citroen next season. Evans's breakthrough performance in 2013 elevated him to the top of the WRC competition. He demonstrated impressive pace in the WRC 2 category, but it was arguably his performance at Rally Italia Sardegna which saw him stamp his authority on the world stage. His sixth place finish saw him join an elite group of 'rookies' to have impressed on their world rally car debut. Evans started his career with the Ford / M-Sport partnership in 2007, winning the Ford Fiesta Sport Trophy series in both the UK and Ireland.